According to a survey of nearly 1500 adults, 64% said that what makes them open an email from a business or nonprofit is who the email is from. When respondents were asked what makes them open an email from a business or nonprofit, the organization the email is from (64%) and the subject line (47%) were far more popular than other factors such as liking the offer (26%) or the first few lines of the body of the email (14%). I just came across this stat even though it is a few years old, but I’m guessing it still rings true today. Face it, people are making a decision to open your email before they even get to the meat of the content. What does that mean to you, as you create and send your e-newsletter? When your recipients receive your e-newsletter, there are two factors that influence whether it is recognized by email servers and by the real human reading your content. 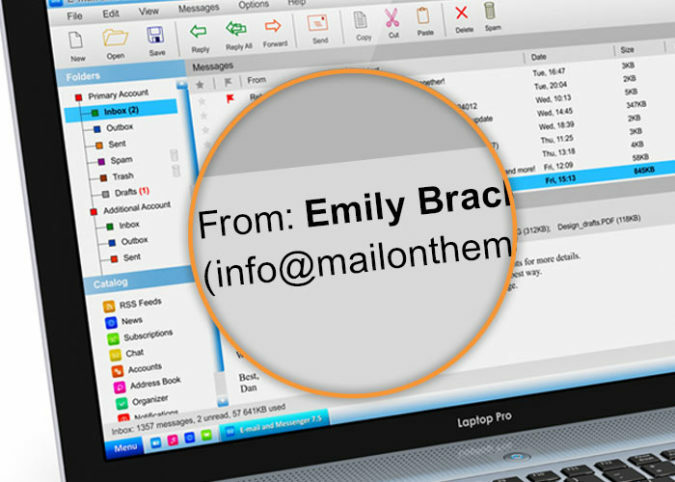 Is your specific email address recognized by the email server and email client of the recipient? The computer systems powering email are looking at the name@domain.com and checking whether it is a known and trusted address. Depending on how your recipients get their emails (Gmail, private email server, via your shared hosting plan, etc. ), there are multiple layers of technology that are deciding whether or not to send your email through to your recipient’s inbox. It may be stopped by a firewall, stopped by a domain-based spam filter, or it may be redirected based on the individual’s rules set up for their own inbox. This is why you want to maintain a known and trusted email address as the from email on your enewsletters. Will your email reader recognize your personal or business name? Assuming your email has been delivered to the recipients inbox, the decision to open it is made based on the real name that shows. For example, you may start sending your e-newsletter out using the email address jane@domain.com. Then, you decide to change the sending address to news@domain.com, but you keep the same visible name: “Jane Smith” —your email readers will decide whether to open your email based on that personal or brand name rather than the email address. Choose the right “from” address for your e-newsletter. If you’ve had personal contact with most of your recipients, you should use that email address as the “from” address of your e-newsletter. This is what we advise for most professional services firms. Don’t change the “from” address of your e-newsletter without considerable thought. We’ve seen it happen where an e-newsletter starts out coming from a specific person’s email address, but as their list grows they make the decision to change it to something more generic like info@ or news@. Remember, that any new email address will be less familiar to both the human recipient and the software that the reader uses as their the email client. Sometimes you need to bite the bullet and change your “from” address, but do it with care. Your current clients are most interested in hearing from you. You probably already guessed that, but reaching out to them keeps you top of mind and introduces them to new products or services you are offering. You will have a higher delivery rate because they will already have your email address white listed. You may be surprised that some of your customers only think of you when considering purchasing the exact product or service you already provided. Introducing them to other services will be beneficial. This is why that old adage holds true that it is easier to sell more to current customers than to sell to new customers. Reach out to new subscribers quickly. When someone joins your e-newsletter list, they’ve just had an interaction with your brand. It may be by making a purchase, joining your list from your web site or from accessing special content and offers like a white paper or promotional coupon. At that time, they are aware of your brand. If you wait a long time to send them anything by email, they may no longer remember who you are or why you have their email address. So, try to email them again within a day or two of their initial contact. The easiest way to do this is by setting up an auto-responder so that every person who joins your email list automatically receives an email from you. Continue sending valuable content. As you can see by these stats, the majority of people are making a decision about whether to open your email or not before they get to the content or offer. Essentially, they are forming an opinion based on previous email communication from you. You’ve earned their trust, don’t ruin it! < Can Your E-Newsletter Survive the New Year’s Purge?